Doug Ross @ Journal: Comcast's "World without Network Neutrality"
Comcast Corp. actively interferes with attempts by some of its high-speed Internet subscribers to share files online, a move that runs counter to the tradition of treating all types of Net traffic equally... The interference, which The Associated Press confirmed through nationwide tests, is the most drastic example yet of data discrimination by a U.S. Internet service provider. It involves company computers masquerading as those of its users. In other words, the greatest democratic publishing platform in history -- represented by the Internet's guiding principle of network neutrality -- is being violated by the duopoly of cable and telephone companies. What Comcast is doing is inspecting the packets of information users send over BitTorrent and similar peer-to-peer protocols. When Comcast’s technology identifies a file being uploaded over BitTorrent, it intercepts and terminates the transmission by falsifying the TCP to look like one of the end users. The [masqueraded message sent by Comcast] is an RST packet, part of the TCP protocol. The correct use of RST is documented here by the IETF and does NOT include its use by any intermediary. Electronic Frontier Foundation confirmed the AP results and also provided additional technical information. ...what Comcast is doing is... wrong if not illegal... I also don’t want anyone or anything masquerading as my computer. Period. If traffic has to be blocked, there are ways to do it without pretending to be me. Contrast the approach taken by Comcast with that taken by Cloud Alliance, a small Vermont wireless ISP which also has to manage its network to assure that some customers don’t hog all the resources. During periods of congestion Cloud Alliance restricts the bandwidth available to all customers. It does NOT try to decide which applications users should run and which they should not. It does NOT spoof being the user’s machine. And it DOES tell the truth about its policy. Once again, the few remaining network gatekeepers -- the cable and telephone companies led by high-priced lobbyists and their lapdog lawmakers -- are violating the principles of network neutrality that led to the Internet's amazing success. The FTC and the FCC should immediately hammer Comcast and any other violator of network neutrality with massive fines and injunctions. In addition, it should block all incumbent telco and cable companies from bidding on the 700MHz spectrum. Think about it: should these monopolistic beltway lobbyists win that wireless auction, they are sure to keep the networks closed and proprietary. Go to Save the Internet now and take action. Contact your representative and tell them that immediate regulation of the cable/telephone duopoly is needed. If we don't stop them. they're certain to the Internet into cable television. At risk is America's technological leadership position and, by extension, its very national security. Go to Save the Internet now and take action. You can read more about this important issue at the The Net Neutrality Index. It is not a Democratic vs. Republican issue. It's not a liberal vs. conservative issue. It's a freedom issue. Take action now against the would-be monopolists who would control all freedom of expression on the Internet. What information? There has been no "network neutrality" policy in place, ever. Does anybody here have to pay extra for access to Google or Flikr as the graphic suggests? This is total bull. The Obama administration is all for "network neutrality" because they want the FCC to have more rent-seeking power over the web and the ability to abridge free speech everywhere. The downside to net neutrality is that in return, the ISP's will force throttling and per gigabyte pricing. In other words, there will be no more 'unlimited' anything; you will pay for every gigabyte you use. Every ad you watch will cost you. Every dumb cat video on Youtube will actually cost you money, not just the time wasted watching it. Look to Canada and see how it turned out for them. 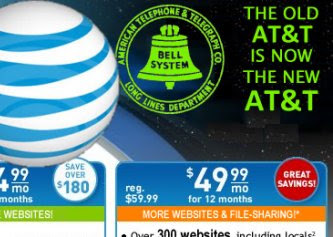 Prices have doubled - or more since they passed their version of NN. The internet must remain free AND it must remain open, unrestricted and free from regulations. Government interference and regulation is NOT the answer. The pressures of the free market should be what shapes and molds the services provided; the customers should have the final say by voting with their dollars, not forced to pay more for less service due to regulations. If history has taught us anything, it's this: government involvement and regulations ALWAYS have unintended consequences, and they are ALWAYS worse than the problem they are trying to fix. Net Neutrality is NOT an exception. Well, well, looky looky - all this time gone by and NETFLIX (who is mysteriously missing from Doug's subscriber packages) is now paying extra towards last mile delivery of its increasingly bandwidth hogging product. 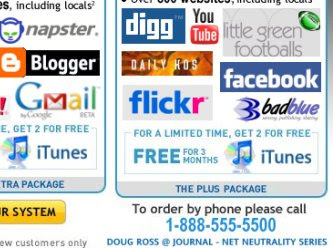 Doug's graphic shows he has absolutely no grasp of the bandwidth issue and the free ride that Netflix had enjoyed. The ranter above talks about cat videos, but refrains from mentioning the neighbor streaming a Game of Thrones HD marathon to his television. I am not a subscriber...I am a "subsidizer". Netflix SHOULD be charging/paying a chunk of that bandwidth, not just for the content. So cable companies should charge consumers on a metered basis... not pick and choose winners among application providers. 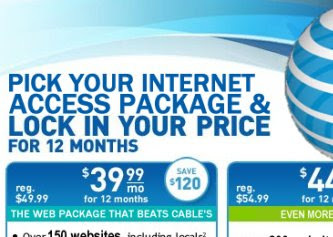 let the consumers pay for the bandwidth they need - how hard is that? Yep and providers will compete by improving bandwith for high users or reducing cost for low users. Content providers will continue to shrink packet size by seeking out better compression technology. Just like the first 25 years of the internet. 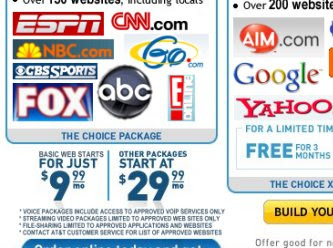 When the graphic internet arrived, Compuserve later AOL, Prodigy and MSN We were paying by the minute. Then along came NetZero and Juno free servers. I love it when a plan comes together. Watch for small local start-ups to push back on the big boys. regulatory hurdles are coming down.